A farmers market full of veggies in every pouch is exactly what you are getting. Simon&apos;s veggie stock is so full of real vegetables you can smell them. 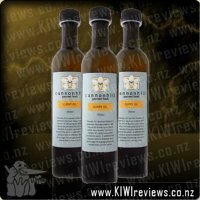 This Executive Chef strength stock will give your meals, gravies and sauces that extra 5% magic that turns a good meal into a great one. Now you&apos;re cooking. I&apos;ve never been one to buy stock in any form, quite simply because I have never really had something to use it for. However in a bid to spice up my cooking and try to cook meals that were more from "scratch" I gave this product a go. 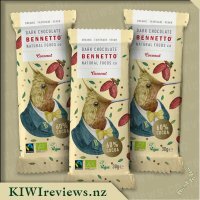 I have to admit that there are a heap of stocks out there on the market (when looking at the supermarket) and I was a bit overwhelmed to start with. There are so many brands that I know, use and trust that I was finding it hard to choose. 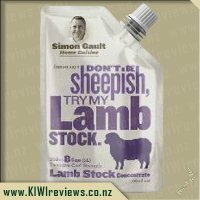 However when I noticed this one with the name Simon Gault on it, I just knew I had to try it. I&apos;ve seen him on the TV and feel like I know his cooking well enough that I can trust him. 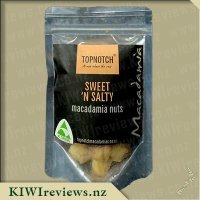 I must also add that the wonderful packaging made this product stand out above the rest and I loved the idea of the resalable screw top. First on the list to try was pumpkin soup and I have to say that this vegetable stock added a gorgeous depth to my soup that I&apos;ve previously never achieved. I love the idea that the stock contains real veggies and that I am secretly adding so much more to a meal than what my children (or husband) realise! Working smarter not harder for sure. This product was super easy to use, and the fact I didn&apos;t have to use it all in one go really works for me. 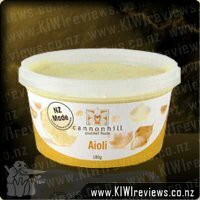 I know I will be able to use this product several times in its 3 week life once opened and in my fridge meaning that it is very cost effective for our family. My husband has also been using this vegetable stock to flavour his quinoa for his lunch. By simply adding some of the stock to the boiling water and quinoa in the pot while it is cooking, the quinoa soaks up the veggie goodness. 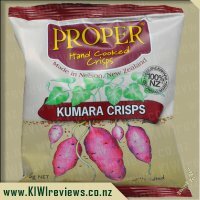 He has now tried all the different flavours in this brand and the vegetable is by far his favourite of the lot. My original intentions with this was to make a nice Vegetable Soup or a Minestrone and while that is still on the agenda I just couldn&apos;t bear to make something like a hearty soup when it was a stunning day which we spent at the beach. We had fish &apos;n&apos; chips for lunch followed with a Mr Whoppie before returning home. We where all not exactly starving so decided to make a pasta. Now I know it sounds crazy using stock instead of a cream for a rich pasta but I had read that this can be used for a great alternative. I was curious as to how it would work out so prewarned everyone that it might not be the best and added the Balsamic Roasted Onion and Parmesan Focaccia bread just in case it bombed out. I fried up onions, mushrooms, celery and bacon in the frying pan while the pasta was cooking and then added the Vegetable Stock with the boiling water. I was rather concerned at first as looked more like a stew the way it came together. Thankfully it reduced over time and although I was still wary it all came together nicely. The recipe I had looked at suggested Goats Cheese and since I had none crumbed up some feta cheese instead. Although deep down inside I kept thinking this is crazy I am using a vegetable stock instead of a cream it was actually really nice and everyone ate it. Neither of the girls asked for seconds mind you but at least the meals where finished. I found the aroma of the Vegetable Stock to be really yummy and when tipping into the boiling water it was a consistancy of toothpaste and glogged out. I did not add any extra to the meal just the bare essentials but next time I will as the sauce although nice was a little suttle. definitely plan on making the soups with this as every soup I have made this year has been with Simon Gaults range and I am loving them. 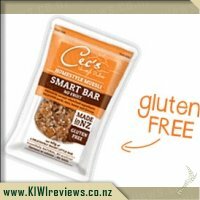 The taste is fantastic and so simple to use. definitely a winner for this household. This is a really interesting product, so to start with you can&apos;t go past the packaging. The stock comes in these little resealable pouches that are similar to what children&apos;s yoghurt comes in (try not to let the kids get them mixed up! Stock on its own isn&apos;t as nice as fruit yoghurt apparently!) 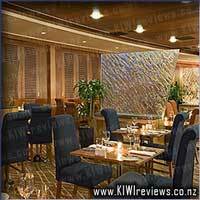 The writing is bold, and in a bright green and is really fresh and visually appealing. This range of stocks stood out to me the other day at the supermarket. The first meal I tried this in was a risotto, and the flavour really changed from what it normally is without the stock, to what the flavour was with the stock in it this time. The stock really added a stronger element to the rice and took it to the next level. I was quiet impressed for the zilch effort using it required. I then attempted to use this when making a gravy from the pork juices, unfortunately it didn&apos;t work out as planned. I cannot pinpoint what went wrong as I often make my own gravy, and perhaps it was the addition of stock instead of water that altered the flavour too much. Last night I made a pumpkin and kumera soup and used the remaining sock as a base. It was simply divine and was a real winder warmer. Although I have estimated the amount when using, it would be good to have some guide on the packet so somehow to break the measurements down a little more. The only other issue I have with this product is that some of the stock is left behind in the packaging as it is thicker than other stocks that you can buy. For the price I don&apos;t want to &apos;waste&apos; any and I found this a little frustrating when trying to work quickly in the kitchen. 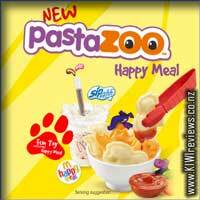 However, this is an awesome product and I also really liked the lamb one. 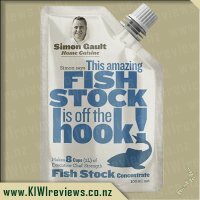 I am a fan of Simon Gault and am always keen to try his samples at food shows. One that I remember tasting was his pumpkin soup and so when I saw the vege stock knew I wanted to give it a go. At the time I had tried this these stocks were not available at my supermarket so it had slipped my mind to buy ingredients to try. I am pleased to say that I can now buy at my local supermarket. I use to use powder stocks, however have found that most of these contain palm oil. By looking at the Simon Gaults seasoning I am pretty sure that these are free of palm oil. I love how it comes in a pouch to keep it fresh in the fridge, however do find that you cannot always get it all out. Having to use it all in 3 weeks is also a problem but have found that freezing this works a treat. I love how Simon has a lot of recipe&apos;s on his website to go with each of his products - it is here that I found his pumpkin soup recipe. I gave it a go and was pleased to say it was awesome. It was very flavoursome. 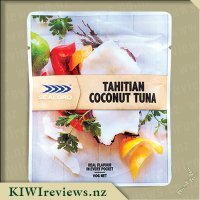 I think that this is a more flavoursome stock than that of powders and am keen to keen it as a stable in my pantry, and also keen to try other products and recipes of his. I&apos;ve never used ready to use stock or stock concentrates such as this product is, but I have used OXO cubes with great regularity on top of chips, over pizzas, in the water boiling my pasta etc. So I figured this would be perfect for trying in some meals in its place. My first try with this was in my rice cooker, added a little to the water, gave it a stir and let it go. Sometimes my rice cooker starts to cook a little too long and I did find that this masked the smell a little longer, so I had more to clean-up after, as for taste, well I found that I needed to add more the next time I made the rice. I added some of this to my boiling water for my pasta to see if it would add a nice flavor to the pasta, which it did but it was a little weak, so again, as with the rice, I would need to add more to it the next time I make some pasta if I want a stronger flavor to the dish. I needed to use more than I expected too each time, so went through this a lot quicker than I had hoped, but it added a nice vegetable soup taste to the meals. At $5.99 though, I think I will stick with my OXO cubes. 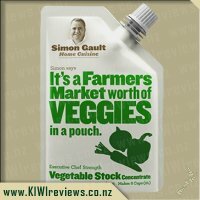 I am a huge fan of Simon Gault&apos;s range anyway, and there&apos;s always a use for vege stock so I was happy when I was given some of this to review. In the last week I&apos;ve made the Moroccan Cauliflower soup from Simon Gault&apos;s website twice and both times it was very well received. They suggest either the chicken or vege stock and I used the vege stock. Perfect considering the second time I was serving guests who were vegetarians. I tend to stick to liquid stocks these days anyway as I prefer them and this far surpasses the other one I use as far as quality and flavour goes. And price is very comparable when you consider that this makes up 2 litres which is twice as much as a large box of liquid stock holds. I never make my own stocks, but still like to cook fresh wholesome food. This stock allows me to do that for very little effort. I like that these can be diluted as recommended, but you can also use them in greater concentration if you wish. This is particularly helpful when I make things in the crock pot as crock pots create their own liquid and it can dilute things too much unless I&apos;m using a stock concentrate like this (I add half the liquid recommended for the stock amount and let it dilute more as it cooks). Although the opened packets keep up to 3 months in the fridge, I actually don&apos;t adhere to this too closely! But I&apos;ve now learnt that you can put them in the freezer and they still stay squeezable so it&apos;s a much better solution for storage and not wasting food. But sometimes I just make up the whole 2 litres at the beginning and freeze what I don&apos;t use in ice cube trays as it&apos;s easy to measure (and I can cut the bag open to reduce wastage). The spout on the packet makes for great resealing but it does mean it&apos;s hard to get every last bit out of the packet. I&apos;ll continue to buy these and recommend them to anyone who asks. 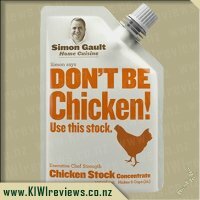 I have seen Simon Gault&apos;s stocks and seasonings at the supermarket a few times in the last few months. I often hover near them and consider buying one or two, but haven&apos;t made the leap yet. As far as stock is concerned I don&apos;t normally get liquid ones, sticking to the powdered ones instead. This vegetable one is a concentrate, that you mix with water in order to make up several litres of stock liquid. The first thing I tried with this stock was to do a change up of my normal corned beef recipe. Into a pot, I put a piece of corned beef, and filled the pot with water til it was just over the meat. Then I added 25 mls of the stock concentrate, some vinegar and seasoning. I didn&apos;t have any cloves or bay leaves. I cooked my corned beef for about 3 hours, and the smell from the pot had everyone asking when dinner was. Miss 8 was so excited, she kept bouncing into the kitchen and asking what the delicious smell was. I have never seen her so excited about a dinner before. Once it was ready, I took the meat out and cut it into slices. 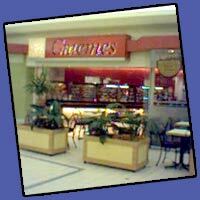 We had it with some checkerboard potatoes and vegetables. The kids could not get enough of the meat. They cleaned it up within seconds and asked for more, more, more. We held off the rest of the meat, once they were stuffed full, for lunch the next day. On sandwiches, with cheese and mustard and grilled til warm. Wow, even better and so flavourful. The next experiment I tried was soup. I haven&apos;t made a soup in ages, but I thought I should give it a go. Into a pot of water, I added a measure of stock concentrate. I also put in a bacon hock. Once the bacon hock was cooked, I removed it and cut the meat off it. I cut up some potatoes and cooked that with the bones and bacon chunks as well. Once it was ready, I added some cream. I served the soup to the girls in a mug and some bowls of soup for us adults. Neither girl liked the soup, which was a bit sad. But my husband did enjoy it and he is not a soup eater in general. I loved it. It was also excellent the second day. This stock has really opened my eyes to trying other stock concentrates. I usually only ever use stock as a powdered flavouring on chips. I love that it comes in a convenient little container. I would easily get 4 uses out of the packet, and it can be kept in the fridge after opening. This is a great addition to my winter menu, because I get a bit stuck in the fries, meat and steamed vegetables otherwise. It was good to mix it up, even if there was some failure in there (at least for the kids).